Posted in posts Comments Off on Why use a SAFE? Bitcoin is all the rage these days. And, so is Blockchain. What’s it all about? Effective May 5,2015 Canadian Securities Regulators have added another burden on companies raising capital from Accredited (i.e. Angel) Investors. Instead of just relying on the honesty of the investor, companies must “take steps” to ensure that the investor is not lying. This blog contains the latest developments in Equity Crowdfunding. Many exits happen at much lower than expected values. Even a three or four fold increase in company valuation may not produce positive returns for the early risk-taking investors. 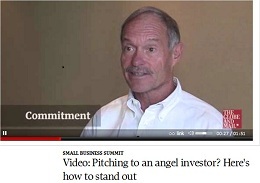 Angel investors and first-round investors are taking it on the chin all too often. Here’s how to stop it. Just a day after I wrote about Crowdfunding becoming the new VSE, the BC Securities Commission issued a notice requesting comment on the idea of a new crowdfunding exemption that would allow companies to raise a small amount of capital (max $150K) from investors in small amounts (max $1500). The more I think about equity crowdfunding the more I believe that this is going to be the new VSE (Vancouver Stock Exchange). It’s almost inevitable when you stop and think about it. Doesn’t “crowd” mean “public”? So why is crowdfunding any different?